This SoundSet Pack includes an excellent cross-section of the sorts of locations you need to run any typical Sci-Fi Tabletop Roleplaying Game. 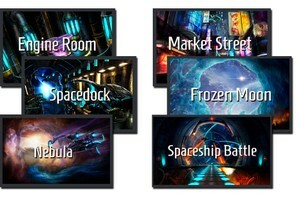 This Pack includes six new Soundsets to add to the Shipboard and Blaster Battle SoundSets that are included free with the Syrinscape Sci-Fi Player. With these SoundSets your players will be able to battle ship to ship with nasty aliens, rush down to their Engine Room only to discover a meltdown too far progressed to fix, try and get their ship repaired at Spacedock, get lost on the streets of an exotic alien planet, be arrested for some embarrassing cross-cultural misunderstanding and end up lying face-down in the snow hallucinating from the penetrating cold that they are back in the arms of a massive and beautiful Nebula.